Condition: Demo Consignment item being sold from our warehouse on behalf of owner. Please request details. 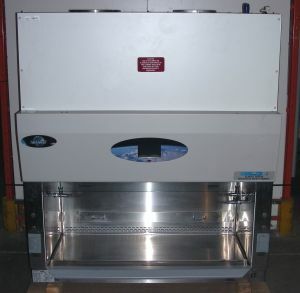 Product Description The LabGard ES NU-430 Total Exhaust Biological Safety Cabinet may be used for work with non-flammable, non-explosive volatile chemicals and radionuclides by providing personnel, product, and environmental protection by exhausting 100% of contaminated air. The LabGard ES Energy Saver Class II, Type B2 Laminar Flow Biological Safety Cabinet includes the stand as pictured and is designed to provide optimum control over product quality in the lab, while also reducing the risk of exposing the product or lab personnel to any airborne biological or particulate chemical agents. This cabinet is intended for use in low to moderate risk-hazard research and drug preparation or product operations. Air Barrier for Personnel Protection: An air barrier keeps you and lab personnel safe while they work. This barrier is created by a strong inflow air velocity of 105 fpm (0.53 m/s) over an aerodynamic airfoil. Laminar Airflow for Product Protection: The cabinet is also designed with Laminar Airflow, which moves at a constant velocity of 60 fpm (0.30 m/s). This feature shields products from cross contamination and also protects the user. This 2012 LabGard ES unit has UV light, 2 cord pass-throughs, back wall pre-filter and additional service valve. It also has a prop up work surface (holds work surface up for cleaning). It also has a 10" exhaust duct collar. Ducting and blower are not included.